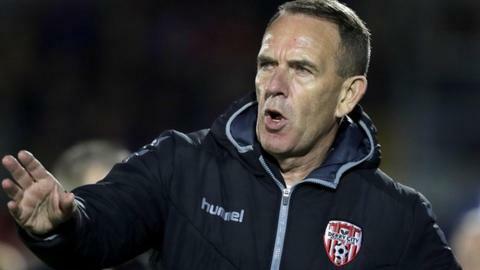 Derry City boss Kenny Shiels has distanced himself from reports linking him with the vacant Coleraine manager's job. "There's nothing in it," said Shiels of the reports. Speaking to BBC Sport Northern Ireland, Shiels, 62, described the reports that he is set to be approached by Coleraine as "untrue". "I can't see it happening. I've not had any contact [with Coleraine]," added Shiels, who guided the Bannsiders to a runners-up spot in the Irish Premiership during his spell in charge at Ballycastle Road in the late 1990s. Shiels' Derry team will aim for the club's first trophy since 2012 in Sunday's final against First Division side Cobh Ramblers. Victory in that game would ensure a home semi-final against last year's double winners Cork City on the final weekend of September.